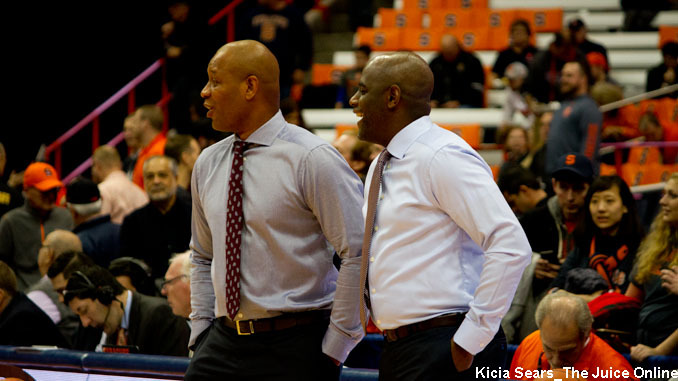 Syracuse assistant coaches Adrian Autry and Allen Griffin look on during a timeout. Saturday night, Syracuse proved to be no match for a highly motivated #10 Virginia Tech team. Coming off a 21-point loss at North Carolina, the Hokies (15-4, 5-3 ACC) jumped all over the Orange at home, blitzing them with a 23-5 first half run and cruising to a 78-56 victory. Tech’s Justin Robinson was electric, hitting nine threes as he piled up 35 points and handed out eight assists, almost single-handedly beating SU (14-6, 5-2). Syracuse simply had no response for Robinson, who had 24 points in the first half, matching the entire Orange output in that time. The Hokies were aggressive from the opening tip, getting into SU on defense and whipping the ball around on offense to twist the Syracuse defense inside-out. Tech ended up shooting over 52 percent from the field and connecting on 14 three-pointers, including ten in the opening half. The hosts also had assists on 23 of their 25 field goals. The Orange offense paled by comparison, as they struggled to get open looks and made under 37 percent of their attempts. Starting eight-and-a-half minutes into the contest, Virginia Tech stitched together eight straight points, pushing a modest lead into a 22-11 advantage. SU woke up and played the hosts evenly for 90 seconds, but the Hokies ripped off ten more points, blowing the game wide open. Syracuse chipped a little off the Hokies’ 37-16 lead, but only got within 43-24 at the break. The two teams seemed to change identities at the break, as the Orange came out of the locker room with energy and Virginia Tech played passively for a few minutes. That allowed SU to get back into the game with an 11-0 run coming out of the locker room. Tyus Battle rattled home a short jumper and Oshae Brissett drove the left side for a slam. Paschal Chukwu flipped in a putback and Brissett crossed the paint on a drive, finishing with a left-handed score. Brissett made one free throw following a flagrant one foul call on Tech and Battle connected on a pair at the stripe coming out of the first media time out, drawing Syracuse within 43-35. Virginia Tech immediately came out of their doldrums, ripping off 14 of the game’s next 15 points, which included holding the Orange without a field goal for just shy of nine minutes. When Frank Howard finally snapped the dry spell with a trey with just over nine minutes remaining, the triple brought SU within 57-39. Brissett followed with a three-point play to make it a 15-point game, but the Hokies would soon follow with seven unanswered points to stretch the lead to 22 points. Syracuse would never get the margin back below 20. Oshae Brissett had 16 points to lead the Orange. Frank Howard connected on three triples for most of his 13 points and also had four steals. Tyus Battle had a rough night, but did finish with ten points. Elijah Hughes struggled throughout the game, finishing just 2-of-13 from the field. Ahmed Hill backed Justin Robinson’s career night with 16 points. Ty Outlaw aided the Virginia Tech attack with nine points. Syracuse will continue their three-game road swing Wednesday when they travel to Boston College. The Eagles (11-7, 2-4) have won their last two games after a four-game slide, including a 65-61 victory at Wake Forest on Saturday. Guard Ky Bowman is a do-it-all player for BC, leading the team with 20.5 points, 8.1 rebounds, and 3.6 assists per game with 43 three-pointers on the season. Wynston Tabbs, Nik Popovic, and Jordan Chatman each average between 13 and 14 points per game for the Eagles, but Tabbs has missed the last two contests with a knee injury. The two squads split their series last season, each winning on their home floor. SU claimed an 81-63 win at the Carrier Dome with Battle leading five players in double figures with 24 points. Boston College took the game on their home floor, 85-70, as Bowman hit five threes on his way to 24 points. Battle also had five treys as he piled up 29 points in the loss. Wednesday’s contest between the Orange and the Eagles will get underway at 8:00pm Eastern. The game will be available on television in certain local markets and that telecast will also be available online at ESPN3.com and through the ESPN app.